Ram Sam Storytime: Flannel Friday - Turkeys! I love this flannel and use it pretty much every year. 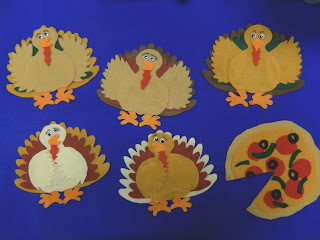 It was a collaborative effort -- one of my brilliant co-workers made the turkeys, I made the pizza and I modified the original rhyme to suit my needs. It can be spoken or sung to the tune of "Five Little Pumpkins". "Oh my! I am immense!" "I guess we'll have to eat pizza ..."
Yes! Like I said in my post, I hate when the turkeys get eaten. I also love the rhyme waddle and gobble. THANK YOU! I am going to do this on Friday for my turkey lesson. So adorable, I was inspired to make my own set too! Thanks for sharing.